This is the juniper salami I made a few weeks ago and I think it’s my best work yet. It has a good, even mold covering on the outside, a firm (but not hard and dry) texture, and a really nice definition of fat mixed with pork. But most of all, I’m just thrilled with the flavor. I used T-SPX, which is a lower acidity starter culture than the higher acidity F-RM-52 I used in the past. 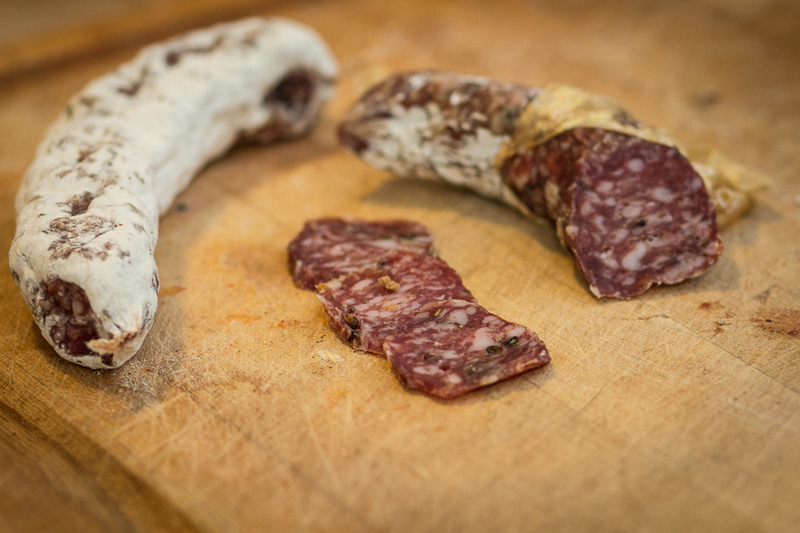 The result is a salami with a more delicate flavor and a less pronounced sour tang, as you might find in summer sausage. Savory, with a rich pork flavor, each bite carries the deep, resinous flavor of juniper, which linger on the palate like the heavy scent of a pine forest. It’s nice, but not overpowering, and makes me want to go out for a hike. Moving forward, it would be interesting to try some other different spice blends in future curing experiments. I found a recipe for dry cured salami from Laos, but it seems so heavily spiced, especially with galangal root, that I don’t think there would be any balance to the natural flavor of the pork. One thing this experiment with juniper berries taught me is that using a single, high quality ingredient in the right proportion can yield a really exceptional product. It reminds me of my pink peppercorn brie from a few years ago. I would like to try a salami cured with fruity-tasting Balinese long pepper, compared to traditional black peppercorns. Saveur also had an interesting article on how Sichuan pepper makes you mouth more receptive to the taste of chiles, so it would be fun to try mixing Sichuan pepper with red chiles, in a take on a traditional spicy Calabrian salami. whats the amount of spices that you used for this salami p/kg? Thanks for the comment! The rosemary was very light, just 1.5g per kg. Since I was using wild harvested juniper berries, I figured they would be stronger in flavor than commercial juniper, and some berries would be stronger and more pungent than others. So I ground up a small handful and sprinkled it over the forcemeat, as you might season a steak with a modest amount of black pepper. By grinding all the juniper up, I hoped to mix the stronger-tasting berries with the more mild ones, and thus have some consistency. But using wild spices, you'll probably encounter variations year-to-year.